Reality: the sky is blue, water is wet, most kids quit piano lessons, and letting that happen is one of the biggest mistakes a parent can make. Treat piano lessons as a daily fact of life. Like eating dinner and going to school. Make piano a part of the routine, not something extra. That 30 minutes of practice time when they get home from school is simply how it is. I have over 30 years of professional piano performance and teaching experience and people talk to me all the time about how they wish they hadn’t quit lessons when they were teenagers. Parents must give kids the best opportunities to succeed and piano lessons are a big part of that. Kids who learn piano have a better long and short term memory. Active engagement with musical sounds enhances neuroplasticity which makes it easier to adapt to new situations. Kids who take piano lessons score higher on tests. Pianos lessons significantly reduce anxiety, depression and stress. Pianists have more connective tissue between the left and right brain which dramatically speeds up problem solving. Pianists have a higher IQ than average. 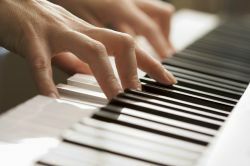 Scientific evidence has proved that learning to play the piano affects and even makes changes on an individual’s brain. …playing a musical instrument, such as the piano, provides numerous benefits for individuals both physically and mentally. I wasn’t allowed to quit piano lessons until I was 18. When I turned 18 I said, “I’m 18, I’m going to quit.” Afer I quit, I found that I could play any music I wanted. Movies, TV shows, radio, anything. It didn’t take long before I developed a new love for playing piano and started taking lessons on my own. Had my mom allowed me to quit when I was younger, I wouldn’t have been skilled enough as a player to even know that I wanted to take more lessons. Scientific reasons for playing piano are key, but social reasons are just as, if not more, important. As an admitted socially awkward person, piano was instrumental in overcoming my own shyness and it helped give me a kind of relaxed confidence that still permeates my existence and helps me deal with society. People want to meet and talk with you. Good pianists are rare and will often get chances to do things that seem amazing to other people. Being good at piano shows dedication and discipline, traits that attract people to you. Piano playing gives you confidence in front of crowds. Piano playing is a fun way to make money. Improvising on the piano is relaxing and meditative. Empathy skills increase as a pianist learns to read the emotion of a room and play the right music. A pianist learns to be observational about their music and how they interact with the world. Opportunities abound for good improvisational pianists, from overseas travelling to working with bands. I have a lot of amazing memories and a good portion of them are due to the opportunities I’ve created and been offered as a pianist. It’s natural to want the best for your children. It’s natural to be afraid of the choices your children make especially if they aren’t the same choices you’d make, even more so when it comes to big decisions. Don’t forget, though, that in the end we all make our own decisions regardless of what other people say, your kids included. Encourage your son or daughter if they want to pursue music. Support them, love them, tell them that you hope it goes well and that your doors are open if they need some help. Don’t be frightened if your child chooses to do music. It could be a short term thing, it could be a lifetime thing, but know that when someone chooses music, the choice is based on what makes them happy. If your child wants to pursue music and you force them to do something else, you are telling them that you don’t care about their happiness. Good memories are worth more than money and the best way to make good memories is to follow your passion and let your kids do the same. At the moment I’m sitting at a nice little street side cafe in Hong Kong watching a pharmacist wrap up bags of dried sea horses while writing this blog post. I’m leaving in a few days, but I’ve been living in Hong Kong like a paid tourist for the last six months because I play piano at night. I don’t think my mom expected me to be a professional musician or travel around the world living in one iconic city after another, and even now she would rather I do something else that provides more financial security. That’s normal, any parent is going to want security for their son. However, the opportunities and experiences that playing jazz piano playing creates are worth more than security. I’m way too happy and have way too much fun to go to that other world where people worry and compete and aren’t doing what makes them happy.